Reporters and other professionals who regularly record telephone interviews know what a pain it is to rig up a phone recording device. 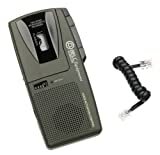 Many people attach special equipment to their regular tape recorders, a less-than-ideal solution that leaves a tangle of cords around your desk. If you're having these sorts of problems, it may be time to step up to something like Bell Sonecor's Microcassette Tele-Recorder. Like most recorders, this device has a microphone jack and headphone jack, but what sets it apart is the telephone handset jack. 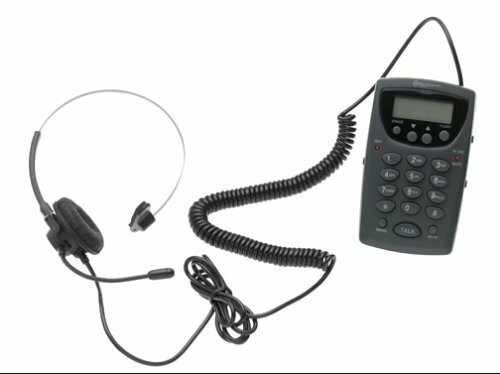 You use the included telephone cord to connect the recorder to the handset (or headset) jack on your telephone's base unit, and then connect the handset to the recorder. This is a great boon to those with multiline telephones, because most recording equipment can interface with only one of the lines. The Tele-Recorder records whichever line is in use at the time. for a home based business w/a cordless phone-- cant use it.Has very good clarity @ close range. detached from the Cassette door, which keeps the door from being held firmly shut. Better 'quality control' would have prevented this. It is difficult to remount the spring because of possible damage to the unit in the process and components are mostly plastic. I am using it as is. Returning it for exchange is not worth the expense involved. The device NEEDS a dedicated AC adapter. I am a salesperson and as such I coordinate meetings with various customer/prospect personnel and technical personnel at my company. I usually set up these conference calls and normally keep the notes of the calls. There are many questions and action items that need to be followed up on as a result of these meetings. This recorder allows me to fully participate in the call without worrying about keeping notes and when the call is over, I can go back and retrieve the entire contents of the call. I can then create notes of the call and send to all parties involved to verify that everyone is in agreement as to the action items from the call and who made what committments. I have 1 or 2 conference calls a day and this device allows me to make those calls as well as my normal call load and have a life. I use to have the Bell Sonecore BE-100HT until I dropped it one two many times and pulled the cord out of the headset. Just got the BE200HT today. Seems to work just fine. I am happy with it. Minor cons. Display contrast is low and hard to read straight on. It seems to be made to read at a low viewing angle. The volume control range is limited. It can be adjusted to between loud and near loud. It just does not have the range from low to high that my previous BE100HT did. The "belt clip" on the back is still the cheap plastic design that broke on my last one. I expect it will not last long on this one either. The write up on Amazon at the time I posted this still mentions cordless/cell/2.5mm jacks. All wrong. The picture is correct though. It is basically a hands free headset that connects with the phone cord and needs 4 AAA batteries. It is worth the ...price though. I am happy with it. I really enjoy using this phone. It is really durable and the batteries seem to last forever, I just wish it was cordless. I liked this phone a lot, but the headset broke within a week of use...I'm not a violent or frequent phone user! I substituted a regular handset on it for now. The description DID formerly say that it was cordless, you weren't imagining things. I still like the base of the phone: the caller ID, the call timer, the non-obnoxious ring, the adjustable volume, etc. Maybe I can buy or construct a new headset for it. It broke in one month of light use.